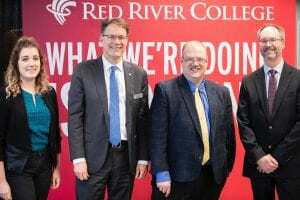 With a little help from its Robot-in-ResidenceBaxter, Red River College joined with the Province of Manitoba yesterday to officially open the new Skilled Trades and Technology Centre (STTC) at the Notre Dame Campus. Education and Training Minister Kelvin Goertzen led the official ceremonies, and assisted Baxter with his task of opening RRC’s newest addition. 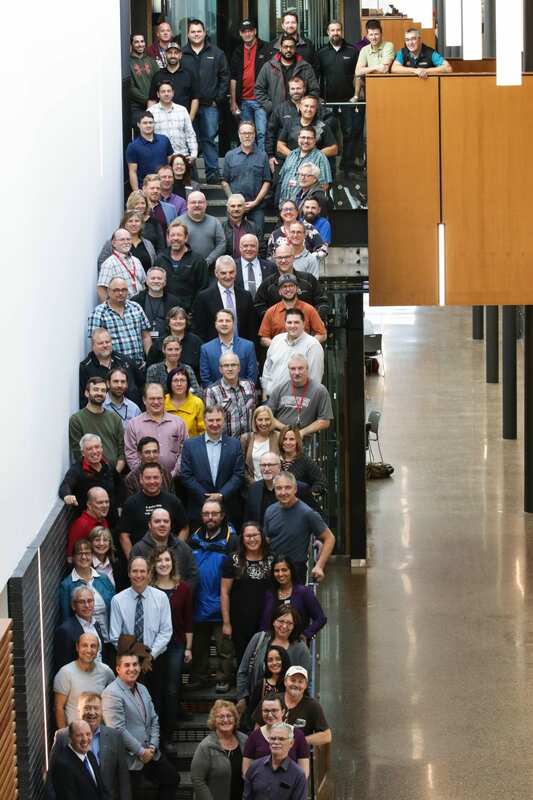 “Careers in the skilled trades are in high demand across the province and this building creates the opportunity for more Manitobans to receive top-level training that will keep our industries ahead of the curve,” said Goertzen. “For 80 years we’ve created programs and innovative learning spaces that equip our grads with the right skills and experience to meet the needs of our province’s economy and its workforce. 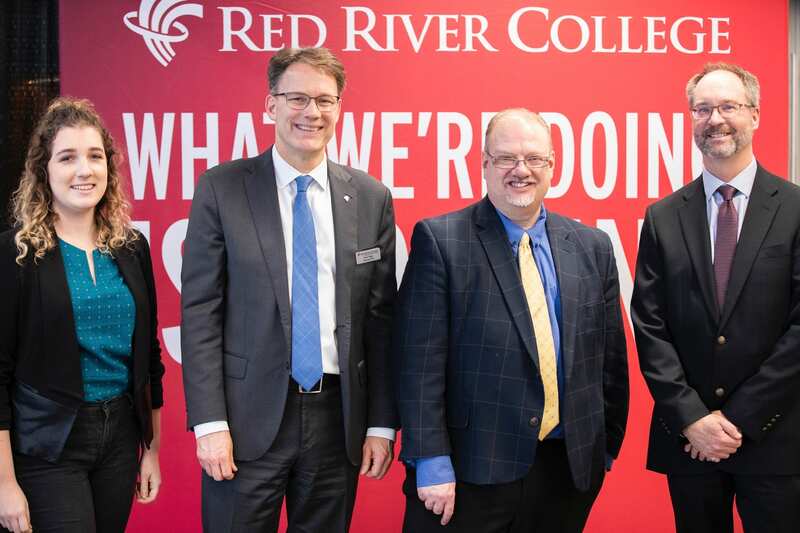 “The STTC is part of the ongoing growth we’ve been experiencing at Red River College – and today, we’re not just celebrating the trades, we’re putting them at the forefront of what we do,” said RRC President Paul Vogt (shown, second from left). Students walked through the doors of the STTC for the first time this August, experiencing what is designed to be a celebration of the trades and technologies. 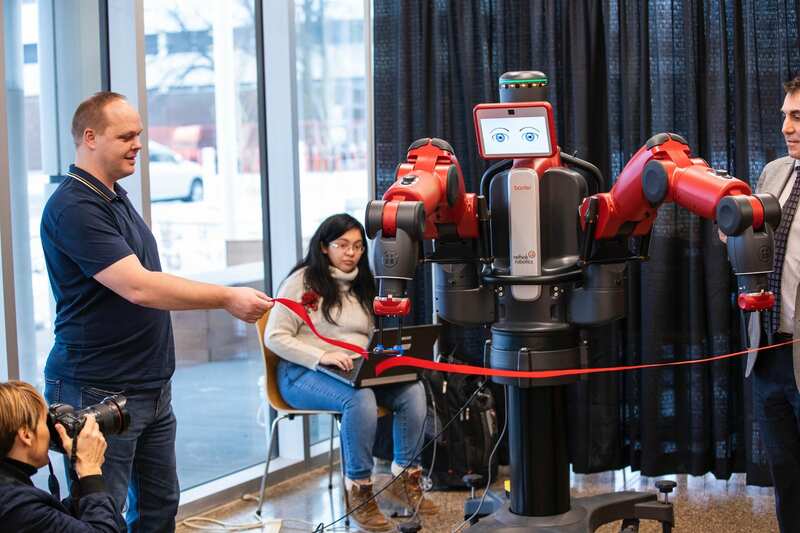 Each program’s unique labs and workshops are on display through floor-to-ceiling windows, and are linked together by the sky-lit Galleria, allowing for industry professionals, staff and prospective students to see skills at work. Sensors in the walls, windows and ceilings will allow students to monitor how the building is interacting with the external environment, and the crawlspaces below the building are tall enough to allow them to study all aspects of its heating, electrical and water systems. Faculty, staff and students played a key role in the design and building process. Number TEN Architectural Group and pico ARCHITECTURE inc. (formerly Ager Little Architects) designed the building after holding hundreds of consultations with the College community to determine needs for today and for the next 80 years. Some examples of student and staff involvement include: student-built workbenches, tool cabinets, PLC and Motor Control instructional stations. The interior and exterior brickwork was designed in the College’s Masonry program and full-sized curtainwall mock-ups were built and tested in the College’s BETAC (Building Envelope Technology Access Centre) program. Akman Construction broke ground on the project in 2016 and are currently working to complete an addition to the building, the Smart Factory, which is scheduled to be complete in 2019. 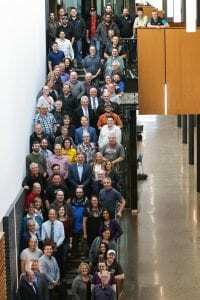 The building has already earned the Green Building Excellence in New Construction award from the Manitoba chapter of the Canada Green Building Council for its efforts in sustainability and LEED Gold target. Some key highlights of the building’s green efforts include a geothermal heating system, tubular skylights, a rainwater retention system and a green roof garden. This project was made possible through the generous support of the Province of Manitoba, Bockstael Construction Ltd. and the Gene Haas Foundation.